Moxie Designs specializes in custom hand painted products for the equestrian that range from stall signs, brushes, grooming totes, bridle holders and more! Any item you receive from Moxie Designs will be of the utmost quality and each piece is truly a work of art. I can’t even begin to describe how beautiful the paint work is. I picked up a custom painted ornament last Christmas and keep it on display year round. You can view it here (#2), and it looks exactly like my horse. It’s gorgeous! Enter below for your chance to win a gift certificate good for one custom hand painted body brush from Moxie Designs! I love Moxie Designs — I follow them on Instagram and their brushes are gorgeous! Amazing, beautiful work – a true artisan! I love their detailed and precise painting! Love Tiffany’s work. Good quality brushes! I would LOVE to win one of these brushes. So gorgeous. I always see their posts on instagram and love how well designed they are! I’d love to have these for my geriatric mare. I love seeing all their creations! Would love to have one of my own! 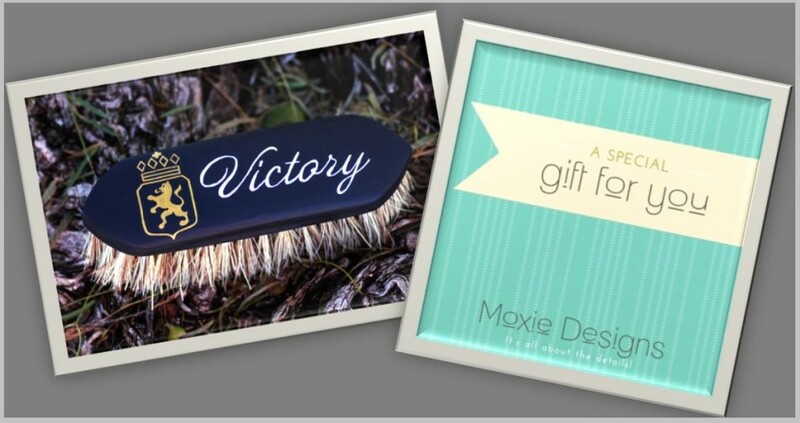 Moxie Designs has the most high class looking custom brushes! Moxie Designs has the cutest brushes! I love how unique they are! I follow these brushes on Facebook, I have always wanted one. Thanks soooooo much for this opportunity! So much talent and creativity! Love the custom designs, a beautiful way to identify brushes as yours! The brushes are gorgeous, always lusting over them! This would be great to win I would love to have one! The brushes are SOOOO incredibly pretty. Beautiful brushes! Would love one ! I covet the artwork on these brushes. It’s amazing. I love Moxie Designs custom artwork. Moxie Designs allows me to have my brushes marked with pretty art instead of my pathetic looking handwriting. This comes in handy in the barn where I board at. I have one of their awesome face brushes- this would make a good addition to it!